Almost every time a company starts a MOM (manufacturing operations management) project, this question comes up: “Can’t we just use our ERP system instead of buying an MOM/MES system?” This is a natural question. Many companies have spent tens to hundreds of millions of dollars on their ERP system and they want to get the maximum benefit from that investment. However, the answer to the question is not always obvious. Modern ERP systems cover a wide range of business processes, including finance, logistics, transportation management, human resources, sales, and distribution. Manufacturing is just one small part of a company’s business processes. So the real question is: Can the ERP software handle the company’s manufacturing operations management processes in addition to handling the business processes? The answer is that some ERP systems can, sometimes, but usually only under limited conditions. Generation of KPIs (key performance indicators). Any ERP or MES system that claims to support MOM activities must provide your basic required functionality. Carefully evaluate how the vendor meets your requirements and if it is provided by standard, configured, or specially programmed modules. It’s important to determine if custom ERP coding to support MOM activities would save money versus a commercial MOM solution. The question of using an ERP or an MOM system to support manufacturing operations activities can be a contentious, but applying a few well-defined criteria can make the question easy to answer. An ERP system can support MOM activities if the basic functionality is supported, the ERP system has a small scope covering a few plants, it supports site-level definitions of workflow procedures, and production can continue for one or more shifts without system availability. Otherwise a MOM-based solution may be the best answer to your manufacturing operations management needs. With a wide variety of production facilities, the “right” answer to the ERP or MOM question may be different at each plant. 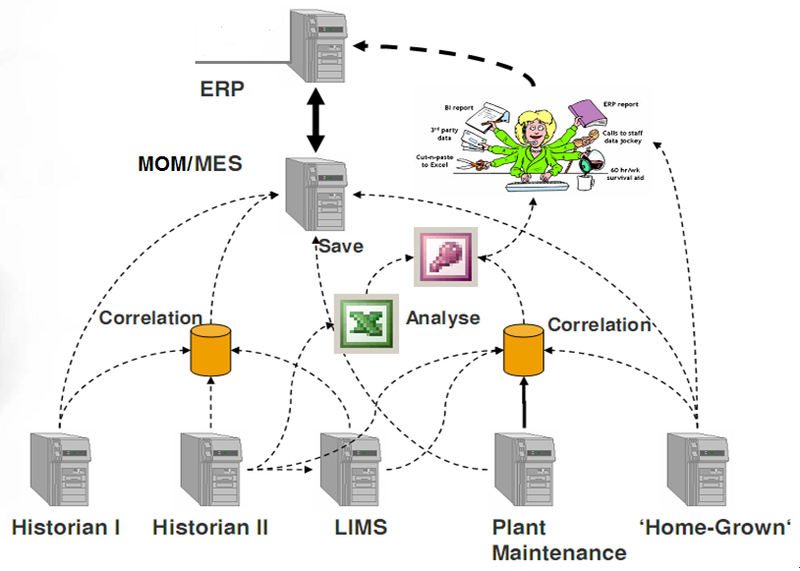 The best solution may be a mixed system with some plants using a local MOM solution and others using a centralized ERP solution. Some plants may be large enough and complex enough to justify a full local MOM solution, while others can live within the constraints imposed by a centralized remote ERP system. Company size, ERP scope – ERP instead of MOM, if the ERP system only supports a few facilities and the number of data exchange transactions between the shop floor and ERP is a few transactions per hour. MOM instead of ERP if your site cannot run for longer than 8 hours using manual processes and paper backups. ERP instead of MOM if your site can operate for 24 or more hours using manual processes(paper). ERP with a local data buffering system instead of MOM if your site can operate between 8 to 24 hours without connectivity to the ERP system. Local vs. centralized control – ERP systems are not normally designed to support local procedures or to handle continual changes to the procedures. MOM instead of ERP if there is significant variability of production processes within the facility or there is significant variability in production equipment and local workflows within the facility. ERP instead of MOM if there are limited local workflows that are not handled by a DCS or batch execution system.